• 1. Find a suitable container. I chose a slightly shallow rectangular galvanized metal one because I wanted there to be a strong visual contrast between the container and grass, but almost any container will do the trick. • 2. Select the appropriate type of grass seed. There are few spots in our house that get direct sunlight for more than a few hours at a time, and I wanted to grow mine on my mantel rather than having to move it around the house each day, so I chose a mostly shade mix. There are tons of varieties, so choose one that fits your home's strengths. 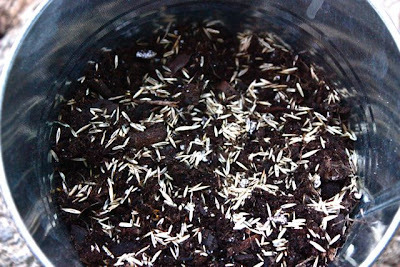 Rye and Wheat grasses are popular choices for potted arrangements for their thicker blades, but I've found that thinner blades of regular grass seed can look just as cool. • 3. Layer the bottom of the container with about a ½-1 inch of gravel or small pebbles to assist with water drainage. 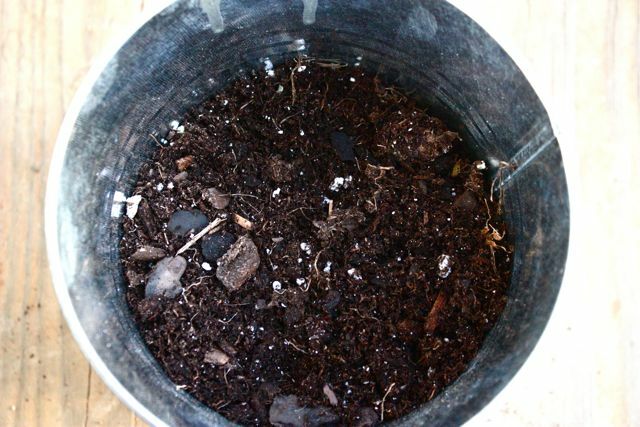 (My container didn't have drainage holes, so this was especially key). 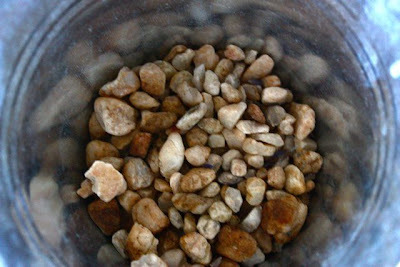 • Cover the pebbles with a couple of inches of soil. I used a combination of top soil from an old potted plant from last year and regular dirt from our yard. • 4. 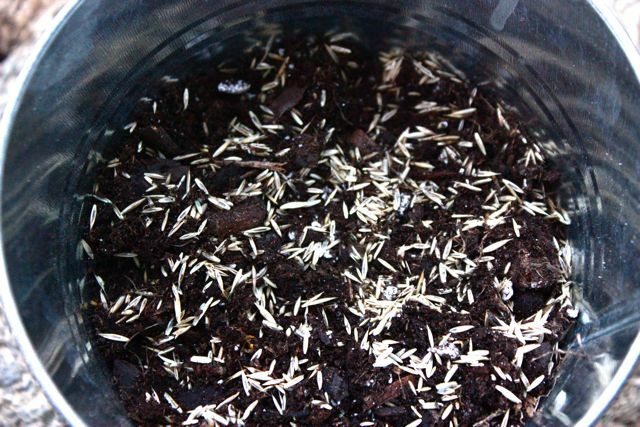 Sprinkle the soil with grass seeds. • 5. Press the seeds slightly into the soil. • 6. 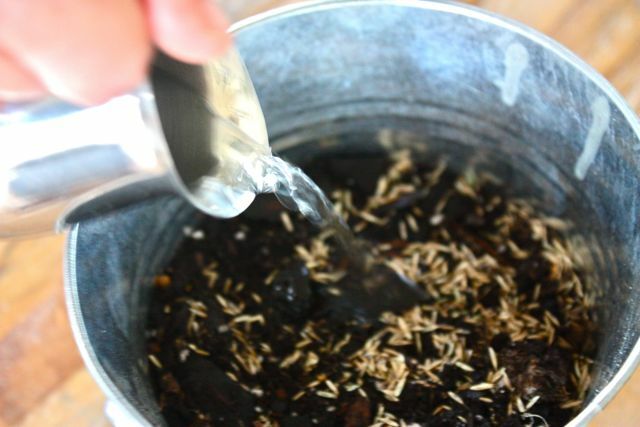 Sprinkle the seeds with water or mist until the soil is very slightly damp. • 7. Place in your desired location. • 8. Mist the seeds every other day. You should start to see growth within a week, or in some cases within a couple of days. • 9. After blades are an inch or so in height, water lightly and evenly every few days. I've had the best results by watering until the soil is damp but no water is sitting above the soil line. • 10. Depending on your desired look, trim the tops of the blades with scissors as needed. This step is optional, and depends on whether you prefer a natural free form tuft or something clean cut. Some blades will grow more quickly than others, and trimming will help to keep a clean/non-scraggly look. • 11. Enjoy! With weekly maintenance your grass could last anywhere from several weeks to several months. This year I went a little overboard, planting little containers anywhere that seemed to need a spot of green...which is everywhere because spring is taking its sweet time taking hold in DC this year. I don't think I ever recall April being counted as a winter month in Washington. So until the grass decides to grow in our backyard we're enjoying lush little pockets indoors! 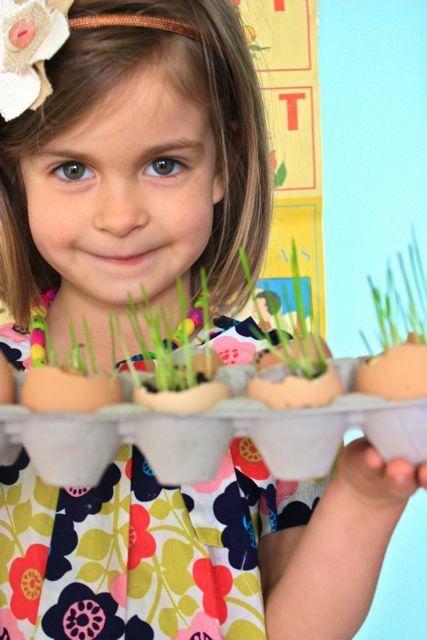 Love it and especially your little girl with her grass eggs...so sweet! Hope all is well! And hostas and zz plants are the most indestructible plants ever..promise! Leah-I can relate. Not surprisingly, the only accidental gardening success EVER around my house was the very healthy gorgeous clematis that climbed up my front porch until last year when we had to cut it back to the ground to paint the porch. Sadly, I am not sure it will return to its' former glory! 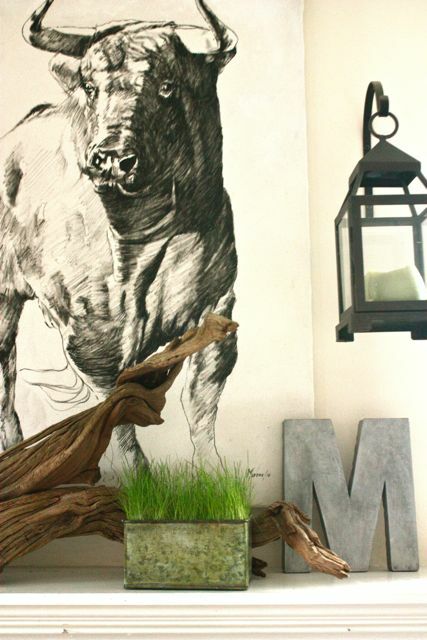 I Love this planting project for the kids especially-almost instant gratification! 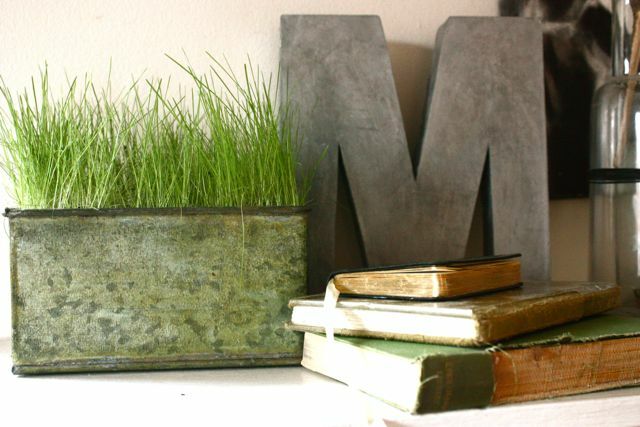 and have always been a fan of little pots of grass...they can be both modern and organic! Tx for sharing! I just found your blog. It is a very nice place to visit. Growing green grass in a movable container garden looks like great fun. And it is low maintenance too. Have a great weekend. Love love love it...you creative mind, you!